Sierra College Makerspaces and the Tahoe Truckee Unified School District are showcasing career opportunities in the Tahoe Truckee community on Friday, December 7 at 6:30 PM at Granlibakken in Tahoe City. Using a fast-paced PechaKucha format, the presentation will be meaningful to those exploring careers or already working in the Tahoe-Truckee area. Sierra College and the Tahoe Truckee Unified School District are hosting a Career Kaleidoscope community event on December 7 in Tahoe City. Eight student interns, supported through the CCC Maker grant funding for student makers, gained real world experience by collaborating with local businesses and non-profits to develop career-focused PechaKucha presentations. To highlight career opportunities in the Tahoe-Truckee area, Sierra College and the Tahoe Truckee Unified School District (TTUSD) are hosting a Career Kaleidoscope community event on December 7 at 6:30 PM at Granlibakken, 725 Granlibakken Road, Tahoe City. Career seekers and those who want to celebrate the diversity of how people make a life and a living in the region will enjoy this artistic event. 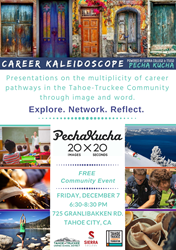 The Career Kaleidoscope PechaKucha is free and open to the public. To develop the PechaKucha presentations, Sierra College students worked with industry partners, according to Dr. Kim Bateman, Sierra College Executive Dean, Tahoe-Truckee Campus. “Eight student interns, supported through the CCC Maker grant funding for student makers, gained real world experience by collaborating with local businesses and non-profits,” said Bateman. Organizations that contributed to the project include the Truckee Tahoe Community Foundation, Truckee Chamber of Commerce, Community Collaborative, North Lake Tahoe Resort Association, Truckee Roundhouse, Moonshine Ink, Tahoe Forest Hospital, Sierra Business Council, Downtown Merchant’s Association and the Contractors Association of Truckee Tahoe. The career clusters that will be highlighted during the PechaKucha include Satisfiers, Traders, Conveners, Catalysts, Helpers, Healers, Creators and Innovators. These were selected based on Dunn and Bradstreet reports of the top industries for growth in employment in the Tahoe-Truckee region. One of the goals of the program is to make high school students aware of careers in the Tahoe-Truckee area, explained Wold. “Through the TTUSD and Sierra College partnership, we are able to strengthen pathways to higher education and fulfilling careers with local employers,” said Wold. Bateman said that Sierra College appreciates the support of Tahoe Truckee Unified School District, Granlibakken, Truckee Tahoe Community Foundation, CCC Maker and local businesses and non-profits that made this event possible. “We encourage everyone to come to this event on December 7 to explore, network and reflect,” said Bateman. “Our students would love to have your support.” For more information, call 530-550-2225. Learn about Sierra Makerspaces and follow us on Twitter @SierraMakers, Facebook @Sierra College Makerspaces and Instagram @sierracollegemakerspaces. Find out about CCC Maker the statewide makerspace initiative, managed by Sierra College, that is preparing students for innovation careers by building their skills in makerspaces. Sierra College District is rising to the needs of our community. Sierra College serves 3200 square miles of Northern CA with campuses in Roseville, Rocklin, Grass Valley, and Truckee. With approximately 125 degree and certificate programs, Sierra College is ranked first in Northern California (Sacramento north) for transfers to four year Universities, offers career/technical training, and classes for upgrading job skills. Sierra graduates can be found in businesses and industries throughout the region.